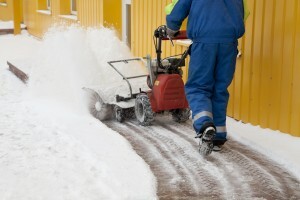 There are plenty of companies offering snow removal in Virginia that service commercial properties. You will likely find that some will offer the option of paying per visit or signing a contract. If you go the pay-per-visit route, you may find that you are spending a lot more than you would if you signed a contract — especially if the area gets a great deal of snow each winter. Also, if you are under a contract agreement, you will probably be at the front of the line when it comes to receiving service. That could be a major benefit if there is a particularly heavy snow and a lot of customers need clearing. Just like any other contractor, a good snow removal company will make communication with customers one of its top priorities. For example, it will keep you informed when major snow events are expected so you can schedule service. The day-to-day operation of your company obviously takes all of your time — even something as important as scheduling snow removal could fall through the cracks if you don’t receive a reminder. Also, a company offering snow removal in Washington DC should let you know any issues the crew may be encountering that could delay their arrival, and what types of services were provided, such as the application of de-icing chemicals. When doing your due diligence, it will also be important to find out whether the company you are considering carries the right insurance, has the right equipment to do the job properly, and is willing to provide a thorough, detailed estimate. Make sure to also ask what amount of snow has to be on the ground before a company will come to your property. Some businesses will not want to send a crew unless at least 6 inches of snow has accumulated. If you want a smaller amount cleared you would be out of luck. Obviously, you want all contractors to be as efficient as possible, and a snow removal company should be no exception. Try not to base your choice on price, but rather focus on productivity. For example, if you choose a one-man operation, it could take him five hours or more to thoroughly clear the property. This could result in a major disruption to your operation. A larger crew, on the other hand, could take care of the job in an hour. Before making the final choice, ask some other business owners what companies they chose for snow removal, and whether or not they would re-hire those contractors. Check the Internet to find reviews of the snow removal companies you are considering to see what other people say about the quality of their service. Be leery, however, when looking at online reviews. If they seem to be overwhelmingly positive or negative, the odds are good those reviews were posted by people with a certain agenda. Also, look at the website of your local Better Business Bureau when conducting research into Maryland snow removal companies. You will probably see that complaints have been lodged against the ones you are considering — just about every company will have some sort of complaint lodged against it at one time or another. The key is to see how the company responded. If it rectified the problem to the customer’s satisfaction, that means it is committed to customer service and would be worth consideration. Finally, once you have researched and are ready to make a decision, trust your gut. According to the website of the National Snow & Ice Data Center, the first patents for snowplows were issued in the 1840s. However, it was not until several years later that the devices were first used. One of the first recorded uses of a snowplow occurred in Milwaukee in 1862. It was attached to a cart and pulled by a team of horses. Several years later, plows were attached to the front of steam trains to help them continue to operate through the winter. Eventually, cranes, steam shovels, tractors and even railway flatcars were outfitted with plow blades. In 1717, one of the first snowstorms on record left nearly 4 feet of snow on the ground in New England and drifts of up to 25 feet high. In 1772, the “Washington and Jefferson Snowstorm” dropped approximately 3 feet of snow in Virginia and Maryland. It was given this name, legend has it, because it trapped George Washington and Thomas Jefferson in their homes for an extended period of time.